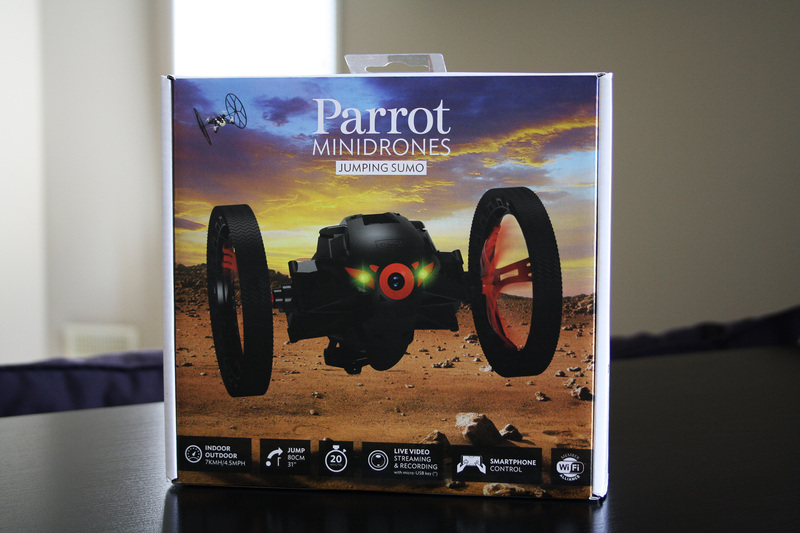 Parrot has mostly specialized in aerial drones with their consumer lineup of models. Jumping Sumo is one of the two new entries in their recently launched Minidrones set. Offering a different skill set than its counterpart, the Rolling Spider, the Jumping Sumo is built from the ground up to traverse and navigate on land. Packaged in a box similar to the Rolling Spider, it comes with a battery and USB charging cable. Three stickers are also included to customize the Sumo’s front face plate. After inserting the battery, it powers up and instantly becomes available to pair with. It requires a dedicated Wi-Fi connection, opposed to the Rolling Spider that simply links through the app. Users will need to go into their Wi-Fi settings and select the private network emitted from the Jumping Sumo. This means that Wi-Fi only devices will not have internet while piloting the drone. The Jumping Sumo is capable of full 360 degree movement and features additional tricks that can be done through the app. The 640×480 front facing camera relays it’s image to the connected mobile device. The AC Wi-Fi network is rated at 50 feet without obstruction. I was able to control the Sumo about 25-30 feet away indoors on the same floor. It was able to navigate through hallways and into other rooms before the connection started to become unstable. The Jumping Sumo can only turn on a 90 or 180 degree angle, so you can get stuck if turns are not planned efficiently. Advanced drivers will learn how to take advantage of the additional abilities to assist in navigating difficult areas. Through the app, users are able to select tricks such as Spins, Taps, Shakes, and a Slalom glide. If the Sumo is stuck, a combination of the tap and spin can help regain your orientation. Shortcut buttons for rotation are located right on the screen and offer an easy way to adapt to the learning curve. 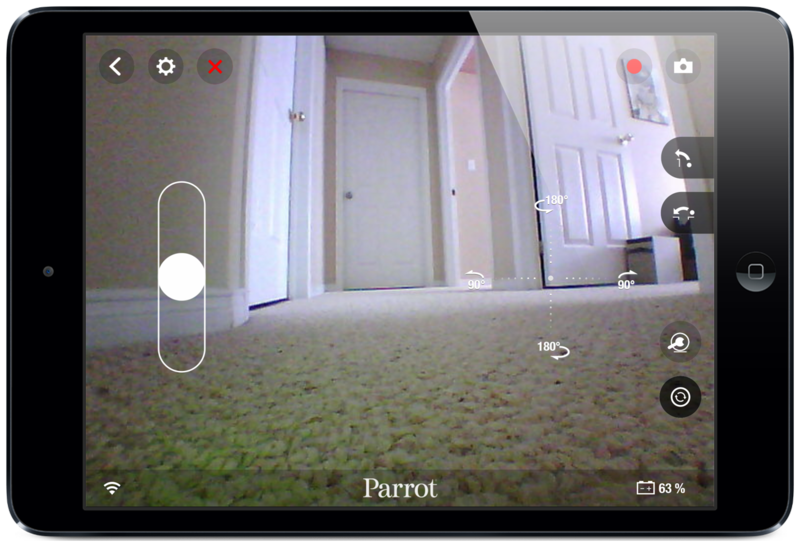 Having the front facing camera makes the Jumping Sumo a fun, engaging drone. Whereas the Rolling Spider must be viewed at all times to navigate properly, the Jumping Sumo can be sent around corners and still be controlled. The app also has buttons for a spring loaded jumping ability. The Sumo is able to leap across a gap or in the air, reaching up to 80cm. This is useful for accessing ledges, tables, or as part of custom built obstacle courses. A spin jump can be found within the skill tree, which causes the Sumo to spin 720 degrees and then jump in the air. The wheels have very little traction, so indoor use is suggested. I was not able to operate it at all in the grass. The built-in rechargeable battery is rated at 20 minutes of run time and fully charges in 90 minutes. This is significantly better than the Rolling Spider, which is limited to 8 minutes. 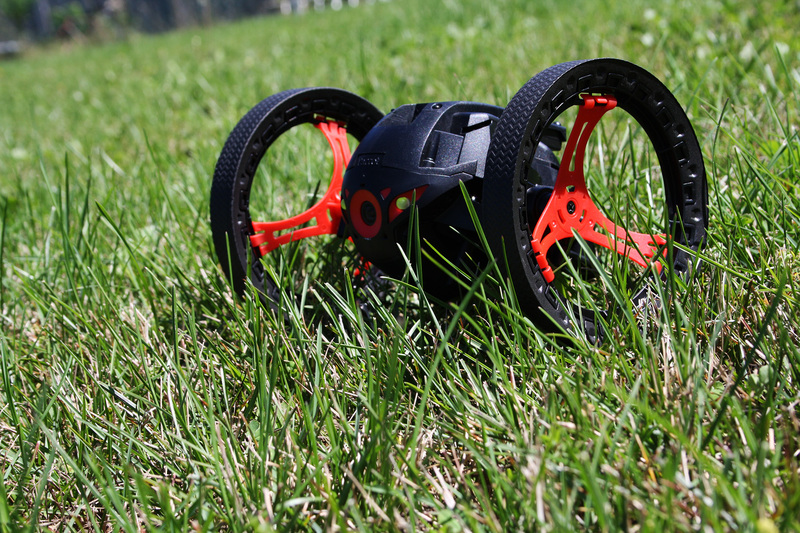 Extra batteries are sold separately and are interchangeable between the Jumping Sumo and Rolling Spider. A USB cable is included in the box, which can be charged through a computer or a USB AC wall adapter. I could not decide which of the two Minidrones was my favourite as they both offer unique experiences. Flying 40 feet up in the air with the Rolling Spider was exciting, but only having 8 minutes of flight time and no live camera impacted the enjoyment. Being able to jump between ledges or onto raised surfaces with the Sumo brings a new level to ground mobility. Owning both of these Minidrones is the best option, but if you can only pick one you will have to decide whether ground mobility or flight is preferred. 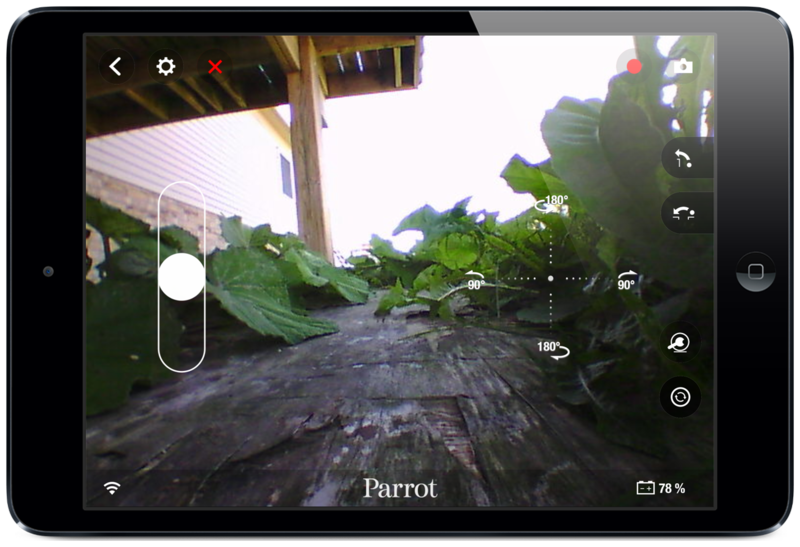 Parrot’s Freeflight 3 app is available for free for iOS, and Android. Click here for a full review of the Rolling Spider.